If you haven’t tasted an Australian wine then you’re missing out! Australia is home to more than 60 wine regions, with exquisite vineyards that produce some of the world’s best wines. 1. The Hunter ValleyThe Hunter Valley is located in the state of New South Wales near Sydney. 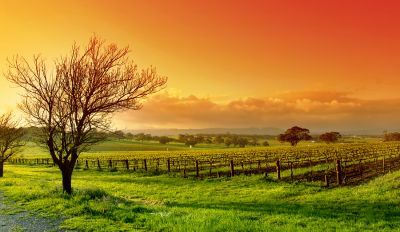 This is one of the most popular wine regions in Australia with around 120 different wineries spread out over the area. There is a lot to do; stroll through beautiful wineries, taste test the best wine the area has to offer or meet winemakers and quiz them on their winemaking secrets.You can also visit the Wyndham Estate, which is Australia’s oldest winery. It came to life in 1830 by a man named George Wyndham, otherwise known as the father of Australian Shiraz. Or you can take part in the Lovedale Long Lunch, an annual fun weekend that includes visits to seven of the top wineries in the area with wine (of course) and gourmet food. 2. The Barossa ValleyHead down to the South of Australia and you’ll find yourself in the Barossa Valley. It’s less than an hour drive from Adelaide and is home to beautiful rolling hills and striking wineries.The area was established in the 1830s by German Lutherans. They used the fertile soil of the land and their sound knowledge of winemaking to create tasty wines. This link to a German past is still evident in the taste of the wine today. While the wine has made the area famous, the Barossa food is just as delicious. Local dishes include; mettwurst (German sausage), lachsschinken (smoked ham) and bienenstich (sweet German desert). 3. Margaret RiverMargaret River is located in Western Australia south of the city of Perth. This area has more than 60 wineries and creates more than 15 per cent of Australia’s premium wine. If you consider that it only produces 1 per cent of Australia’s total wine, the area is a prime spot for tasting the best Australia has to offer.This area is particularly well known for their standout Chardonnay and Cabernet Sauvignon. There are over 150 wine producers in the area and there are also restaurants with incredible views of the vineyards, market gardens that showcase the best produce the area has to offer and cute art galleries that provide a glimpse at the local talent in the area. 4. Australian Capital TerritoryThe area around Canberra, capital city of Australia, has around 140 vineyards and 33 wineries. The history of winemaking dates back 160 years. Many of the wineries are small and tranquil, providing an intimate wine tasting experience. There are also many cute cafes, rustic accommodation and local markets and festivals to attend. Indeed it’s a great area to sit back with a glass of wine, a platter of cheese and take in the incredible views of the rolling mountains.From the famous Hunter Valley near Sydney to the incredible Barossa Valley in South Australia, you’ll find a wine region that suits you!